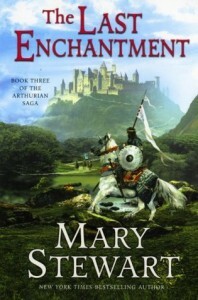 The Last Enchantment covers the first decade or so of Arthur’s reign. While I found myself enjoying it more than The Hollow Hills, it suffered from the same flaws I found in that book – namely, the second-hand nature of much of the narrative. Nearly everything is related to Merlin by a third party with the exception of Melwas’ abduction of Guinevere and Merlin’s tutelage of Nimuë, whom he believes is a boy in the beginning. Yet even in the latter episode, Merlin spends much of the time in a dreamlike trance, then falls into a coma and is buried alive in his hermitage at Bryn Myrddin; and, in the former, he’s the rower who takes Bedwyr to where Guinevere is held, he doesn't do anything. I can’t blame Stewart entirely for this. In the Arthurian romances and in many modern interpretations, Merlin is not the focus (if he’s incorporated into the tale at all). Traditionally, he’s the power behind the throne, the advisor to the crown, the uneasily tolerated enchanter of an ostensibly Christian king, and it’s hard to make him the center of any tale. Thus, in this series, most of the great tales of Arthur’s court are narrated after-the-fact by couriers and visitors to wherever Merlin is: The 12 battles that secure Arthur’s kingdom, the massacre of the innocents when Mordred is born, Guinevere and Bedwyr’s adultery, Accolon and Morgan’s plot to murder the king, etc. She lifted her head. Her face was tragic. "Yes, and how you gave it! I only pray that you cannot remember! You had told me to learn all that you had to tell me. You had said that I must build on every detail of your life; that after your death I must be Merlin.... And you were leaving me, slipping from me in sleep ... I had to do it, hadn’t I? Force the last of your power from you, even though with it I took the last of your strength? I did it by every means I knew – cajoled, stormed, threatened, gave you cordials and brought you back to answer me again and again – when what I should have done, had you been any other man, was to let you sleep, and go in peace. And because you were Merlin, and no other man, you roused yourself in pain and answered me, and gave me all you had. So minute by minute I weakened you, when it seems to me now that I might have saved you." She slid her hands up to my breast, and lifted swimming grey eyes. "Will you tell me something truthfully? Swear by the god?" "Do you remember it, when I hung about you and tormented you to your death, like a spider sucking the life from a honey-bee?" I put my hands up to cover hers. I looked straight into the beautiful eyes, and lied. "My darling girl, I remember nothing of that time but words of love, and God taking me peacefully into his hand. I will swear it if you like." Relief swept into her face. But still she shook her head, refusing to be comforted. "But then, even all the power and knowledge you gave me could not show me that we had buried you living, and send me back to get you out. Merlin, I should have known, I should have known! I dreamed again and again, but the dreams were full of confusion. I went back once to Bryn Myrddin, did you know? I went to the cave, but the door was blocked still, and I called and called, but there was no sound –"
Contrary to what one might think given all these negative things I’ve had to say about the series, it is reasonably engaging, and Stewart is a fine writer. My disappointment arises because I think she could have pushed the envelop a bit more in developing more interesting characters or letting Merlin be more engaged in the events he narrates. It’s on now to the final book – The Wicked Day – which is told from Mordred’s point of view, and I’ve always been sympathetic to him (e.g., “Chichevache”).